'A room that was never meant to be' was a one-time exhibition, curated by Neue Berliner Räume, that took place in a never-before-seen subjacent hall of the C/O Berlin building on Oranienburgerstraße. The space was created by closing the hall's ceiling after the Second World War, and has not been seen publicly once in its years of existence. As the pending renovation of the Postfuhramt is soon underway, the room will surely disappear again. 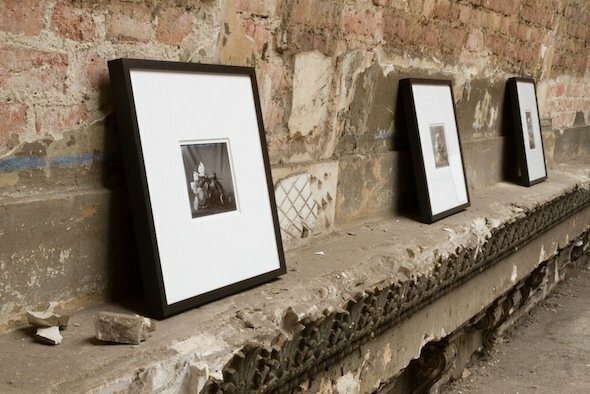 In a somber celebratory note, this exhibition presents the melancholy works by artist Jodie Carey from the Elegy series (2012). The space is not only a secret, but also a stunning merging of new and old, bright and dull. These contrasts are both thanks to the space and its unique architecture, but also to the perfectly tailored curatorial program. The openness of the ceiling with its hazy light seeping through thick plates of glass contrasts the heavy layers of architectural surfaces, peeling away in sections from the previous elements-- a tangible representation of the building's history. The works also play upon this notion of time, layers of history, peeling pieces, and decay. Both the works and the room were stripped of their former elegance, and with this, the space carries an overwhelming sentiment of loss, missing, melancholy. Consisting of five cohesive images printed upon original photographic plates produced in the 1920s, the works of art are layers of history alone. At this time, such a material was at the center of photographic technique; but in this context, the plates are elevated above photographic material and fade into the elements the room themselves, mimicking the tiles and moldings wrapping the surrounding walls. As the plates' function in photography has since disappeared, architecture like this space has also faded into such rarity. Just as these plates were found and reused by the artist, similarly was the space found and repurposed even if just for one day. Berlin Art Link - The insiders guide to the international art scene.